An enchanting gemstone and an expertly crafted ring go hand-in-hand in this creation. 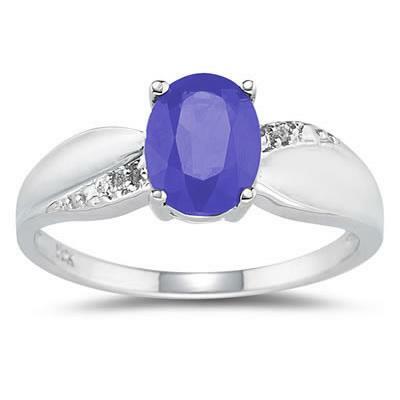 The allure of tanzanite is given a starring role in this ring with a oval shaped 8 by 6mm gemstone. The rich purple hue is stunning when paired with the lustrous 10K white gold band. The band is uniquely crafted to flare wide on either side of the stone and then narrow at the bottom of the band. Resting on either side of the tanzanite stone are two white diamonds that give a hint of sparkle to this beautiful ring. We guarantee our Tanzanite and Diamond Ring 10K White Gold to be high quality, authentic jewelry, as described above.